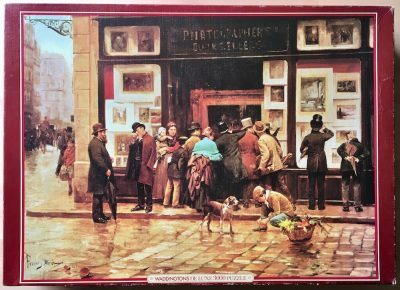 An extraordinary jigsaw puzzle by Schmidt, very difficult to find, although it appears every now and then. The Allegory of Spring is one of the most important works by the Italian Renaissance painter Sandro Botticelli. This puzzle is like NEW, with all the pieces SEALED inside the original plastic bags. The box is in very good condition, except for some transparent tape added to the corners for reinforcement. 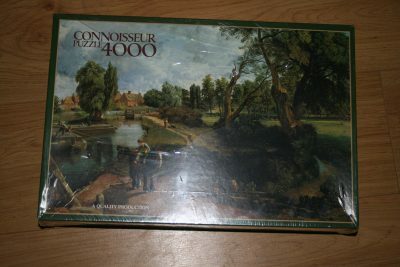 Educa published a 2000 pieces version of this puzzle in 1996, and a 1500 pieces version in 2001. Puzzle size: 157.8 x 107.3 cm. Box size: 49,5 x 32 x 7 cm. Other titles: Der Frühling; Le Printemps; La Primavera; Voorjaar; Våren.